NEW BRITAIN - School officials are quick to point to the strides the city’s public schools have made and the improvements in graduation rates, but also acknowledge that the education system here still lags behind other cities in the state in many categories. The comments come on the heels of a report released earlier this week by the American Savings Foundation – a local nonprofit that funds several after-school programs and educational initiatives in the city through its endowment. The report notes positive changes in the pre-kindergarten experience, chronic absenteeism - an issue city schools have been struggling with for some time - and an uptick in the graduation rate, though New Britain ranks lower than other Connecticut communities. Starting with New Britain’s youngest students, the percentage of kindergarten students who attended pre-kindergarten has increased by almost 30 percent since 2002. The percentage, 76.6 percent, is almost at the state’s average of 79.2 percent. The district has also made strides in reducing chronic absenteeism, which refers to students who miss 18 or more school days in a year. In the 2011-2012 school year, 26.8 percent of the district’s students were chronically absent. In 2015-2016 that number was down to 18 percent. According to information from the Connecticut State Department of Education, 9.6 percent of the state’s students were chronically absent in the 2015-2016 school year. Rodriguez said reducing chronic absenteeism was a focus of the school district last year and remains so this year. The city’s high school graduation rate has been gradually increasing since hovering just over 50 percent in the 2010-2011 school year. For the 2014-2015 school year, 68.6 percent of the district’s high school students that began high school four years earlier graduated. The graduation rate is still substantially less than the statewide average of 87.2 percent. About 81 percent of the population of New Britain has a high school diploma or higher compared to Connecticut’s average of 89.9 percent. The city also has less college graduates living in it than the state’s average, at 18.8 percent compared to 37.6 percent. According to statistics from National Student Clearinghouse about the New Britain High School graduating class of 2008, 51 percent of graduates enrolled in college the fall following graduation. Nineteen percent of the 2008 graduating class earned a bachelor’s degree within six years of graduation and an additional 8 percent earned an associate’s degree. Rodriguez said career readiness and providing students with 21st-century skills is an ongoing focus of the school district. “We want to continue these strides while keeping an eye on what’s trending in the workforce,” Rodriguez said, noting the importance of making sure graduates are career-ready. Collaboration and support from non-profits like the ASF have helped contribute to the school district’s educational improvements. Specifically, the ASF helps fund many after-school programs for New Britain students that help keep them interested and involved in learning. Just last year the foundation awarded grants to nine after-school programs in the city, including $80,000 for the OIC’s “Moving Mountains” program and $70,000 for the YWCA’s “STRIVE” program. STRIVE, which stands for Strength, Teamwork, Respect, Individuality, Vision, and Excellence, is a youth development program which helps middle school girls work on their education and social and emotional skills. The program has 45 students at Slade Middle School and 25 at Pulaski Middle School. 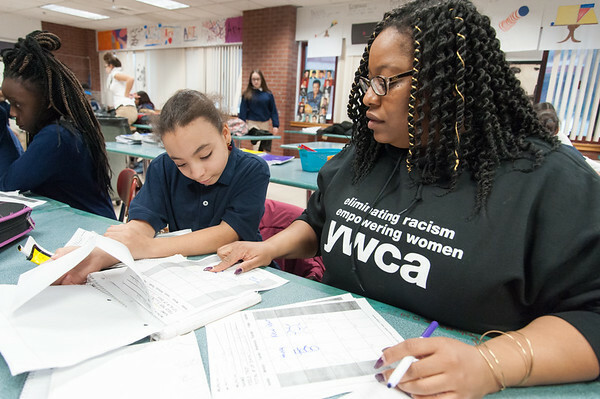 Mallory Deprey, school-age coordinator for the YWCA of New Britain and former member of the Board of Education, said the program involves team building, homework, weekly fitness activities, health and nutrition classes and more. Girls involved in the program told The Herald they have loved the experience. “It’s like our own, tiny little family,” said eighth-grader Genesis Pelliccia. Genesis Wilson, also an eighth-grader, said the program’s counselors are helpful and supportive. “If we ever need to go to them and talk to them about stuff that’s happening at home, everything is confidential,” Wilson said. Lexi Pinero, Slade Middle School’s eighth grade class president, said her involvement in the program completely turned her school career around. “Before I started it I had bad grades, and I was hanging out with the wrong people and stuff,” Pinero said. “Now that I’ve been here I’ve made new friends, my grades are better, and I pay more attention in class because I think about coming here. Pinero compared the program to a sisterhood and said strengthening friendships was the most important part of her involvement. Yeyris Ortiz and Marlene Regalado, two students from the Caribbean islands, said the program has helped them learn English. “This program helps build their self-esteem,” said Alicia Rosado, a para-educator at Slade who works with the girls in the program. Rosado said the program, and others like it, are important to students like Ortiz and Regalado who come from other places and aren’t acclimated in the district yet. Regalado said she liked the different field trips the group takes, and Ortiz has come out of her shell since starting the program. She is now in Slade’s boxing program, while also playing soccer. Maria Falvo, president of American Savings Foundation pointed to programs like STRIVE as being part of the solution to challenges educators face in keeping children engaged in learning. “A lot of the work we are doing is making a difference and we want to stay the course,” she said. Posted in New Britain Herald, General News on Friday, 12 January 2018 22:00. Updated: Friday, 12 January 2018 23:02.